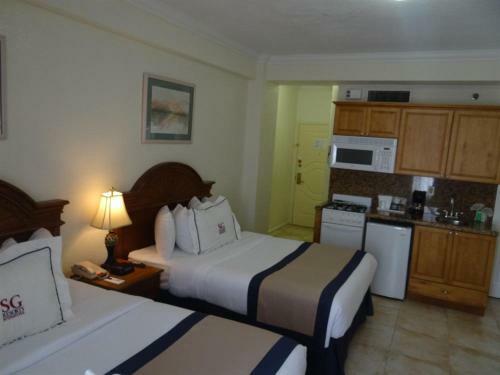 Hollywood Beach Resort -Large Studio is located in Beverley Beach and offers a casino and a tennis court. Guests staying at this holiday home have access to a fully equipped kitchenette. The holiday home is fitted with a satellite TV. The property has a hot tub and a fitness centre. A children's playground is available on site and diving can be enjoyed within close proximity of the property. Miami is 36 km from the holiday home, while Miami Beach is 27 km from the property. Fort Lauderdale-Holly...wood International Airport is 13 km away. Hollywood Beach Resort -Large Studio is located in Beverley Beach and offers a casino and a tennis court. Guests staying at this holiday home have acc...ess to a fully equipped kitchenette. The holiday home is fitted with a satellite TV. The property has a hot tub and a fitness centre. A children's playground is available on site and diving can be enjoyed within close proximity of the property. Miami is 36 km from the holiday home, while Miami Beach is 27 km from the property. Fort Lauderdale-Hollywood International Airport is 13 km away.